A whisk is certainly a handy little utensil to have floating about the kitchen. From scrambled eggs to whipped cream, it does its job easily and efficiently. That doesn’t mean the design cannot be improved upon. With bunnies, for example. The Kikkerland Rabbit Silicone Whisks, 2-Piece Set is a whimsical upgrade to a kitchen essential. 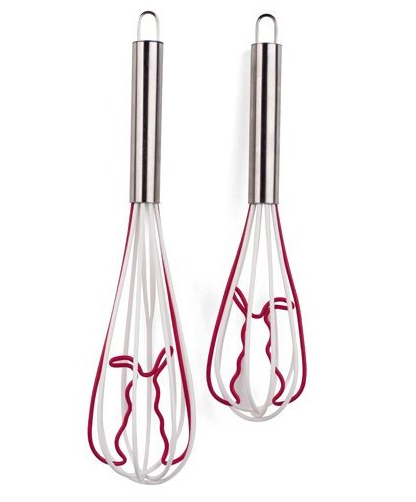 Both the 8-inch and 11-inch whisks in the set feature red and white silicone construction complete with a molded rabbit silhouette worked into the design. And if rabbits aren’t your thing, they are also available in Squirrel and Bird varieties.